I have been meaning to post this gorgeous party for oh 2 months! 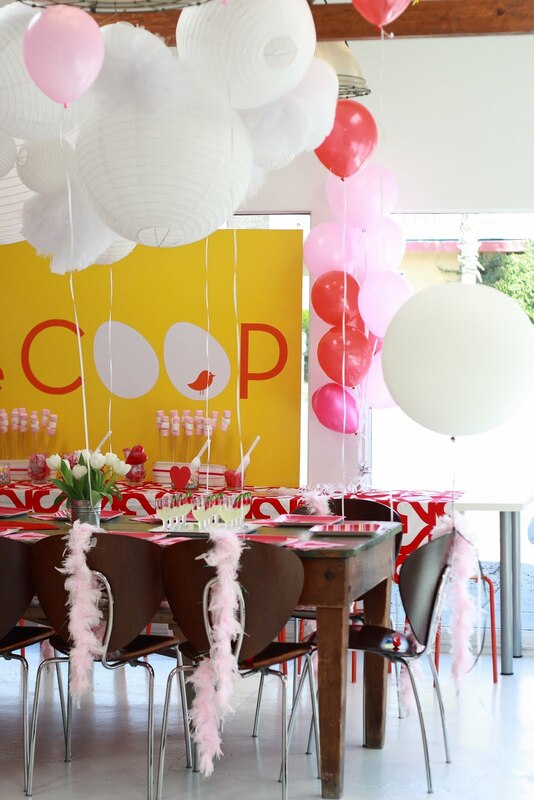 Thankfully the COOP has been so busy doing wonderful parties that I haven't had the chance..For Valentines day this year Jules and I decided to invite our Fabulous COOP customers to join us for an afternoon of love and fun. D.J. Groovy David, www.groovydavid.com was spinning the tunes, we had heart crafts and yummy treats. The fantastic pictures above are all courtesy of one of our favorite photographers Razi Wilson www.raziphoto.com and the gorgeous model is one of our dear customers Zoe. Thank you to all the Coopers who came out and celebrated love day with us. People often ask if they can have adult parties at the COOP... and the answer is a resounding YES! 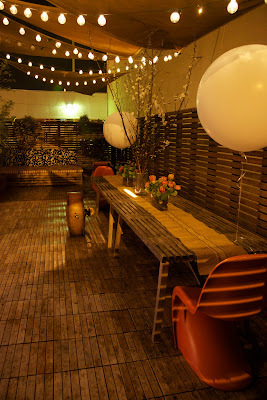 We have done quite a few cocktail parties, 30th BDays, 50th BDays, HOliday parties -- you name it! 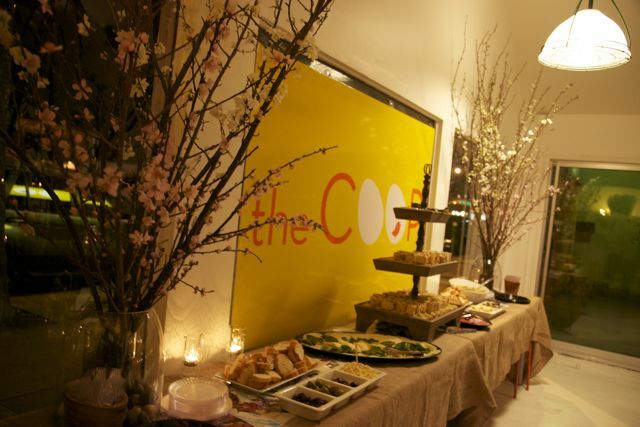 Just this weekend I was so happy to host an event for the alumni of my children's school at the COOP. I feel so very fortunate to send my kids to this wonderful small progressive school, Children's Community School, in Van Nuys. It's the tiniest little gem of a school, that treats my kids with such love and respect it makes me swoon. I adore the school -- and though I am fortunate enough to be able to afford to send my kids to a private school -- I am not someone who can really throw loads of money at them for all the amazing work they do everyday. Believe me -- if I had that kind of cash -- the school would have a new library or something -- that's how much I love them! So -- it was so wonderful to do this event for the Alumni and teachers to celebrate CCS's 30th Anniversary this weekend. 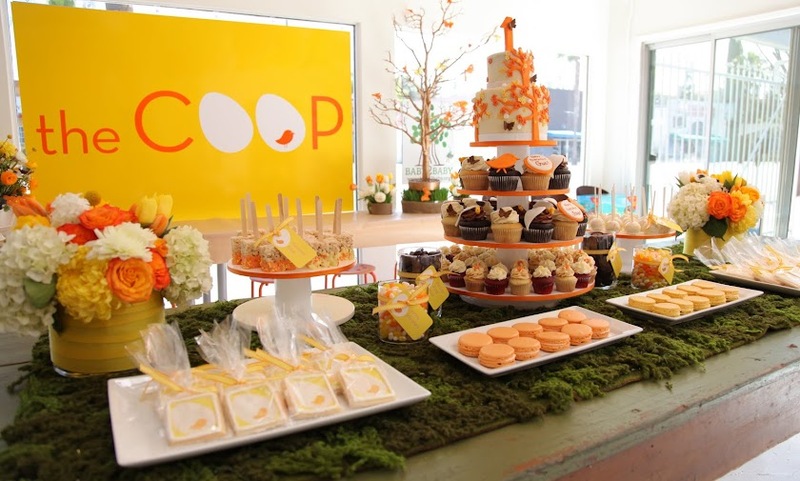 I was so happy to show just a tiny sliver of my gratitude in the form of a beautiful event at the COOP. I wanted to do a sophisticated look -- so I spent a week or so gathering green and glass and gold pedestal bowls and vases and did a load of tiny arrangements (succulents, rannuculus, cabbage, lilac, anemones -- lots of different flowers in greens and purples and whites) down the center table with a burlap table runner. I am SO pleased with how it turned out -- the flowers and the candles -- I thought it just looked magical. 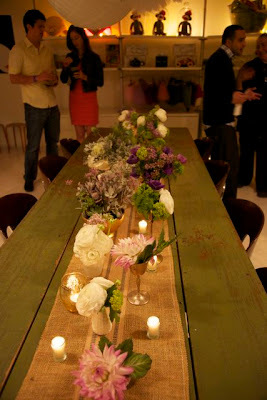 The back food table was covered in burlap (one of my favorites!) - with a wonderful spread of food artfully displayed between 2 vases of cherry blossom tree branches that I put in vases with rocks at the bottom. Very earthy -- and the height of the branches made quite a statement in the room! 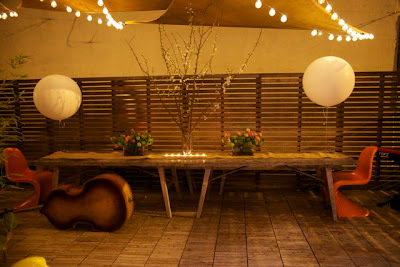 Out on the patio, there was a three piece band/ orchestra playing -- which made the space feel heavenly. I love our patio at night -- with the globe lights... the candles... and the glow from the inside (the dance floor actually creates quite a beautiful glow at night!). 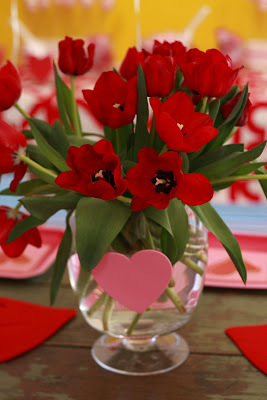 I did these AMAZING tulips outside -- I am not exactly sure what type they are -- they seem even more spectacular that a parrot tulip -- they are so large and ruffle-ie ... they looked like peonies (my FAV... but not in season right now) and I interspersed the vases with these bright green grassie plants. I love love loved those arrangements -- and for some height we did a cherry blossom tree (smaller in scale) out there as well. 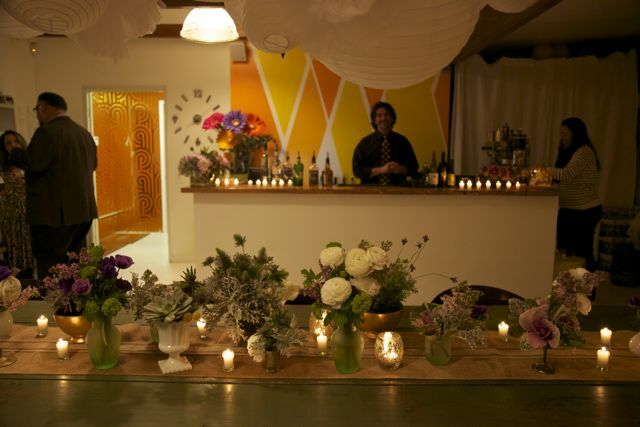 We used the front "lobby" desk as a bar -- which we have done in the past and it works beautifully. The event was a huge success -- and I was so proud of Lucinda and I to have created this amazing space, and so pleased to be able to do something beautiful for the people who are helping me to guide and teach my beautiful boys every day. It was a very proud mommie/ momtrepreneur moment for me! Oh my goodness -- I simply cannot believe that I have a NINE year old! It seems crazy to me. I swear I can remember being nine myself -- and it doesn't feel like it was THAT long ago. My little guy is nine now.... and of course we had to celebrate in style. His BDay was actually super bowl Sunday -- so we went with a football theme. It was so so fun. Lots of work, of course -- more than usual as when it is my own kid I have to pull out ALL the stops! But it was well worth it as Finn really had a great time -- my little baby... nine years old! Crazy. 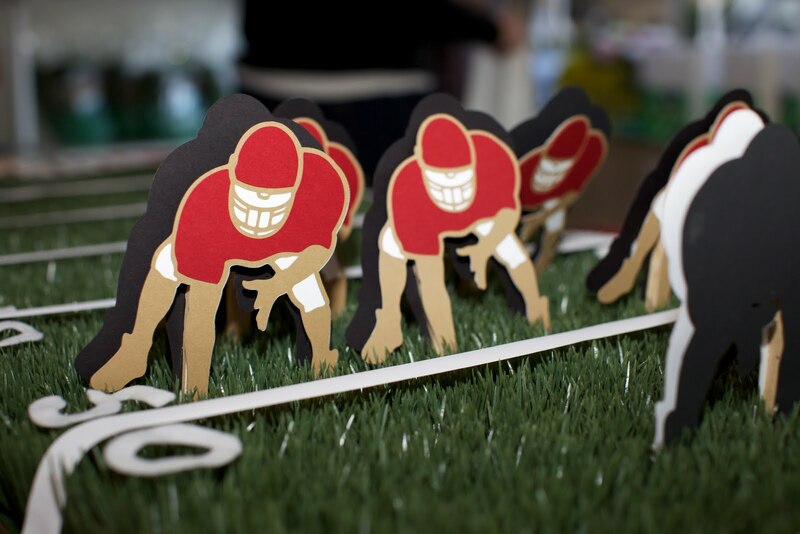 I wanted to do something fabulous for the main table -- so I got some tall artificial grass mats and used them as a giant football field... complete with these adorable football player cut outs that I found on etsy (actually I found the treat bags and banner there -- and then I asked her if she would just do some players on their own -- that I then glued at sticks and stuck in the grass!) 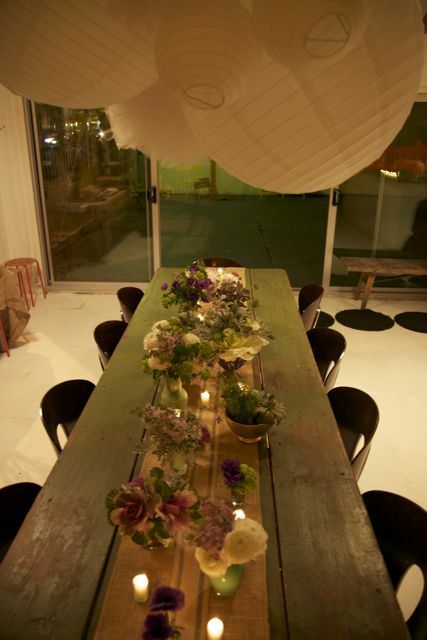 I love how that table turned out! 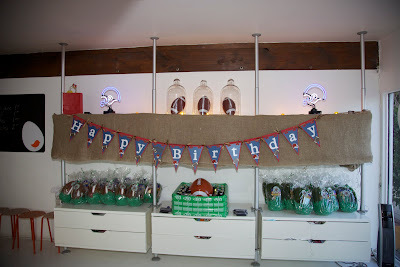 The treat table was also pretty fab -- this was the first time I used those BIG balloons -- and now I am addicted to them. They are so chic and fun. Love love love them. Very COOP-ie.... slightly more fabulous than your average balloon! I made the ribbon garland to hang above the treat table which I love -- and plan on using again and again (I am even considering it as a seaweed or jelllyfish costume for me come Halloween!) The fantastic Julie from Blue Cupcake did the amazing cake tower and I surrounded it with green and white (mostly) candies for the kiddies. 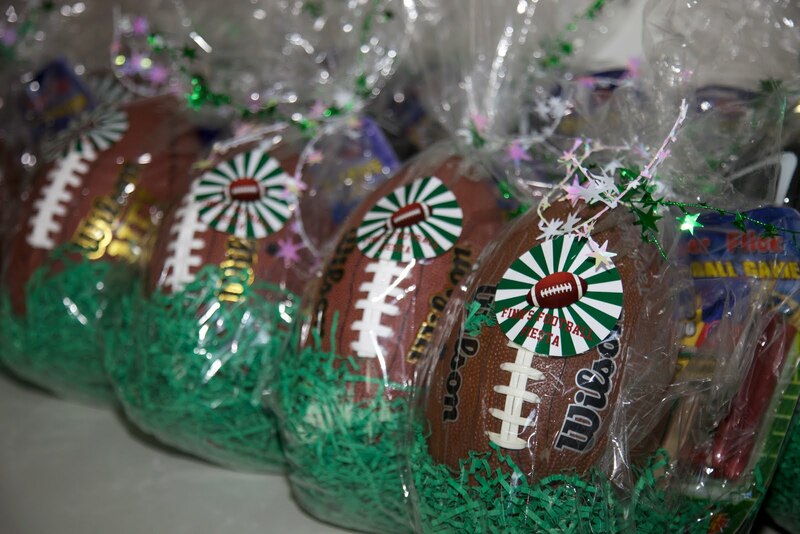 Outside -- I did more giant balloons -- interspersed with some football shaped balloons on the snack table. 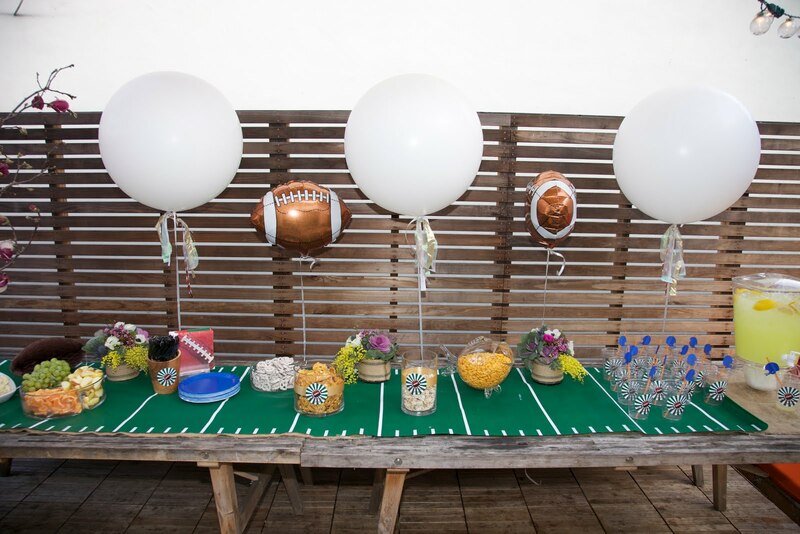 I stuck "Finn's Football Fiesta" stickers on all of the glass snack and candy containers and the lemonade cups -- even the goodie bags... which really made for a nice cohesive look for the party. I really loved how the whole party turned out. It was cool for a nine year old (helmet shaped jello jigglers, neon football helmet signs, footballs for all - and candy, candy candy!) -- but chic for his mommy (footballs in bell jar cloches, fresh flowers and burlap) . A perfect combination -- just like us! Tea for 20? Of course. Tea for 20 Princess? 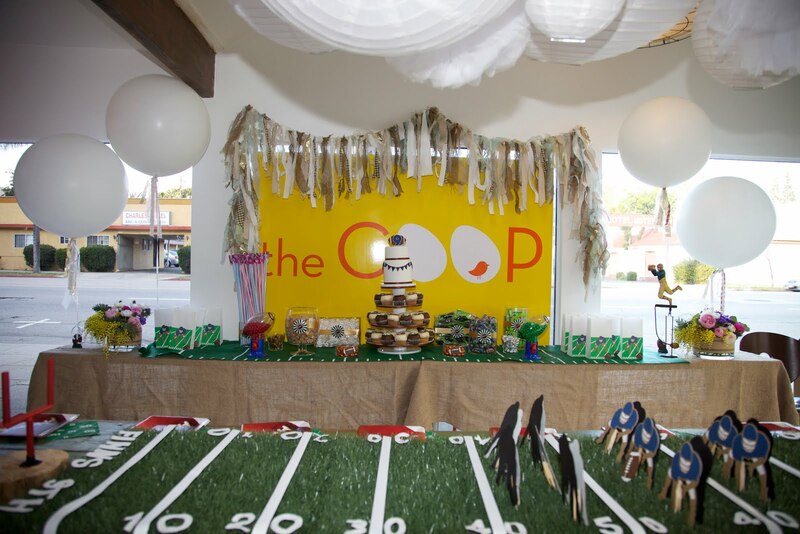 the COOP, of course! We did a lovely tea party for one of our favorite little ladies recently (this was her THIRD party at the COOP... love that!). 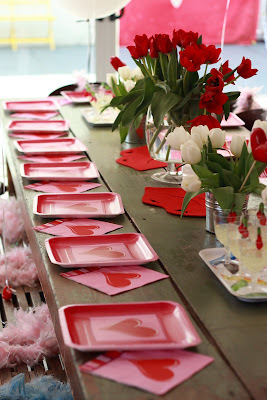 She only invited her girl friends.... so it was pretty, pink princess to the MAX! 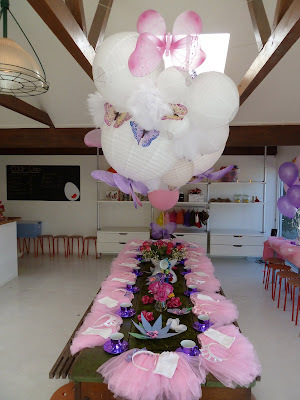 Lucinda made the little towers of tea cups for decor (so adorable) and we used our mossy grass table "runner"... with real roses and some artificial flowers strewn about -- including those sparkie purple paper flowers I made (that I was quite proud of!) We jazzed up the white ball chandelier with some pretty butterflies in different shapes and shades of pink and purple. All of the gorgeous princess guests received a tutu, white gloves, a tiara and a very fabulous super colorful mercury glass tea cup and saucer. The girls were thrilled -- and looked simply divine sipping on "tea" in their tutus and tiaras! Sweet Sawyer just had his one year old BDay this past weekend -- and he wanted to celebrate it at the COOP of course!! He came straight from his photo shoot at the beach for the GAP (I'm not kidding!) into his colorful cars party celebration! He is simply gorgeous, and his family is just lovely. We wanted to do something really cute and colorful for him -- and a wee bit "younger" than our usual cars themed party. We came up with the party above -- and everyone was thrilled. We used these cute Rubbabu vehicles as gifts for everyone, which I love. They are super bright -- kind of squishy -- and have a cool fuzzy texture. When my boys were little they had a big one -- and they ADORED it. I think it made a great gift for this party, along with the tire sippy cups and those cute checkered flag bandannas. The party was a big bright fantastic celebration -- hope you enjoy the pics!